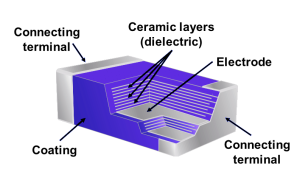 Ceramic Capacitor & Dielectric Materials - Circuit Functions Inc. Ceramic capacitor advantages include low cost, small size, transience resistance, and being non-polarized. However, their weaknesses include having a large voltage coefficient and aging rate, which becomes increasingly problematic as industry standards move towards smaller and smaller capacitors. A large voltage coefficient causes a capacitor to be unstable over VDC, or Volts of Direct Current. The class of dielectric within a ceramic capacitor affects the capacitor’s aging process. “Ageing,” as it refers to capacitors, describes the negative logarithmic capacitance change that occurs in ceramic capacitors over time. The more stable the class of dielectric, the lower the aging rate. The aging rate, or aging constant, is defined as the percentage loss of capacitance due to the aging process of the dielectric which occurs during a decade of time. It is expressed as percent per logarithmic decade of hours. COG/NPO dielectric class ceramic capacitors typically have almost negligible rates of capacitance loss over time. X7R capacitors typically have a <2% per decade of time aging rate. COG/NPO capacitors are the common Class I type of capacitors, which are not as volumetrically efficient as, for example, X7R capacitors, but they are more stable with environmental conditions, and they do not exhibit audible buzzing or ringing – also known as piezo effects. Class II and Class III ceramic capacitors, however, can have more widely varying characteristics: they can expand and contract with applied voltages, causing piezo effects. Class II and Class III ceramic capacitors include X7R capacitors. X7R capacitors are commonly used as blocking, decoupling, bypassing and frequency discriminating elements. High voltage capacitors are needed when a high Dielectric Withstanding Voltage (DWV) is required. They must be DWV tested at their specified voltages to ensure that Flashover, or arcing, does not occur. This testing is conducted by applying the DWV voltage to the capacitor, where the charging current is limited to 50 mA. High voltage ceramic capacitors include X7R and COG/NPO dielectrics. A growing number of applications require capacitors that can survive and operate in extreme environmental conditions. High temperature ceramic capacitors are used for applications in down-hole drilling, oil exploration, geophysical probes, automotive and avionics, aerospace, industrial markets and electronic equipment which are exposed to harsh and rugged operating environments and high temperatures. For example, electronic equipment used in oil exploration may be exposed to high temperatures while also subjected to extreme shock and vibration. For some down-hole environments, a leaded capacitor may be used in order to design against severe shock and vibration, providing strain relief especially in drilling tools and larger case sizes. Both COG/NPO ultra stable Class I capacitors and X7R stable Class II capacitors deliver high performance at extreme temperatures. Class I dielectric materials are very stable with temperature changes, whereas Class II dielectric materials exhibit stable performance, but not to the same degree as Class I dielectrics. The temperature coefficient for COG/NPO (Class I) is +/-30ppm, from -55°C to +200°C. X7R (Class II) temperature coefficient of capacitance is typically +15%, -45% from -55°C to +200°C. The capacitance value for X7R Class II capacitors is also affected by the applied voltage. Exposure to higher DC operating voltages can result in a significant loss in capacitance. For more information, or to request a part, please contact us!